Of the five beaches attacked on 6 June, Omaha saw the sternest fighting. Well-placed defenders on the high ground and extensive beach defenses did their job. On top of this, so much had gone wrong with the first wave: many of the amphibious DD Sherman tanks didn't reach the beach. They were released from their landing craft too far away where the greater swell swamped them and the troops landing on Omaha missed their firepower. Another problem was that many units landed in the wrong place. Strong tides and winds carried the landing craft off line and led to confusion. Finally, the German emplacements and defenses were well-placed on high ground and the only cover on the beach - the seawal - was over a killing ground. There were 32 fortified areas located between the Vire River and Port-en-Bessin: in all, 12 of these strongpoints were able to direct fire on Omaha Beach. The attacking forces-units of the US 29th and 1st Inf Divs - suffered over 2,000 casualties, many of them drowned during the approach, but led by US Rangers, themselves misplaced (they were the follow-up troops to Rudder's Rangers who had scaled the Pointe du Hoc) the American troops pushed forward and by nightfall, they had gained hold of the beach and its immediate hinterland. Despite the casualties, 34,000 troops had been landed by the end of the day. They are lavishly illustrated…good value for money and are recommended. 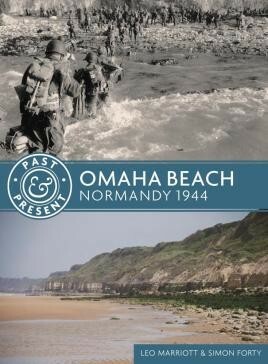 If you have never been, I think this will encourage you to visit Omaha Beach, and it would be handy to take this with you for reference while you are there. These books are great for all ages but the younger me would have loved them and each volume is an ideal present for the history mad youth in your family.